Germany based Rokla GmbH is a young, dynamic company, that five years ago set an ambitious goal for its Rockwheel brand to become a byword for cutting drums all over the world. 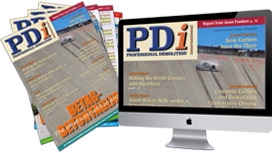 PDi’s Andrei Bushmarin visited the German go getter to talk about its ongoing quest for success. Langenburg is a little gem of a town hidden deep in the Baden-Württemberg countryside. A tiny place it might be, it is also a place of interest. Langenburg boasts a vintage car museum and a magnificent schloss (castle) overlooking a beautiful ravine. The castle is home to Philipp, the 10th Prince of Hohenlohe-Langenburg, a close acquaintance of Queen Elisabeth II and other royal families. And last but not least, Langenburg is the home base of Rokla GmbH. Ian Webster is a British engineer who has authored numerous developments in cutting technology. 30 years ago his main area of expertise was roadheaders used predominantly in coal mining. During the 1980s, the then British Prime Minister Margaret Thatcher closed down most of the coalmines in the UK, making Ian Webster face a career altering situation. After some deliberation, he found a way to turn adversity into triumph. His idea was to use a roadheader’s cutting unit as an independent attachment. This seemingly simple solution opened endless application opportunities ranging from demolition to landscaping to cleaning ladles at steel mills. The prospects were dazzling, but seeing himself primarily as an inventor rather than an entrepreneur, Ian Webster needed somebody who would put his vision into practice. Robert Piasecki began his career in construction machinery in the late 1990s working as an apprentice at Schaeff Group, the German manufacturer of compact excavators. Originally a family owned company it was acquired by the Terex Corporation in 2002. During his time at Schaeff, Robert learnt the nuts and bolts of the business, and met the two men with whom he would later embark on a quest to conquer the world. One was Klaus Volkert, a colleague of his at Terex who at the time held the position of financial director. Predictably, the other person was Ian Webster. Their first meeting happened at the Stuttgart airport where a young Robert Piasecki was dispatched to collect Ian. The youngster was impressed by Ian’s wealth of knowledge but was too shy to say anything. However, when some 15 years later Robert and Klaus decided to launch their own company, it was Ian Webster whom they called first. All three joined forces in 2013, marking the birth of Rokla GmbH. The fledgling company got down to business with the energy and passion, which are intrinsic parts of Robert’s persona. Born in Poznan to a Polish father and German mother, he was brought to Germany at the age of 13, so he knew only too well what ‘starting from scratch’ really meant. Rokla got off to a good start, with a winning combination of innovative technology, German manufacturing prowess and relentless sales drive, which all contributed to its rapid growth. It only took about half a year for the Rockwheel brand to begin gaining recognition both domestically and internationally. The company presented its products at many construction trade shows, while Robert flew all over the world quite literally drumming up business. Rokla’s first, and so far its most successful international dealer is Pennsylvania based Alpine. Founded in 1968 by Wilhelm Kogelmann, the company is one of most established suppliers of demolition and recycling equipment in the US. Today Alpine is run by Wilhelm’s son Chip Kogelmann. Robert’s and Chip’s friendship dates back to the Terex times, and under Chip’s leadership Alpine made a tremendous job of promoting the Rockwheel brand on the American continent. The US now tops the list of Rokla’s overseas markets, followed by Germany, the UK and China. Robert Piasecki is a staunch believer in the drum cutting technology. According to him, there is no application where a cutting drum cannot outperform a hydraulic hammer by a long mile. Even such challenging tasks as granite extraction or the demolition of heavily reinforced concrete structures pose no problem for drum cutters. At the same time they do not generate as much noise and vibration as breakers, spare adjacent structures from damage, and produce an accurate profile when tunnelling, excavation or surface preparation work. However, the best thing about drum cutters is that there is almost no limit to their scope of applications. They are equally capable of taking out concrete buildings and tree stumps, descaling the ladles and furnaces in steel mills, or being used in quarrying, underwater grinding, trench cutting, contouring or profiling, and so forth. Rokla offers a comprehensive range of cutting drums for carriers ranging in operating weight from 1t to 125t. The entire Rockwheel line up can be divided into three main categories based on the type of drive system employed. The smallest units designed for light-duty tasks come complete with chain drive. The most popular solution for 3t to 12t carriers is the G5 or G5 twin drums, with the G standing for ‘gearbox’. For mid-range excavators, Rokla recommends using cutting drums equipped with direct drive. Consisting of only three elements – housing, motor and drum – these units offer an optimum value for money ratio. For real heavy hitters in the up to 125t weight category, the German manufacturer has designed a monster of a cutting drum. Weighing in at 5,420kg, the powerful G125 unit features a twin motor providing an output rate of 400kW and a rugged gearbox. Axial cutters, cutter buckets, patch planners and plate compactors complement the extensive Rockwheel range. Since its launch in 2013, the German company has grown into a trailblazer and pacesetter in the drum cutting industry. With its headquarters and manufacturing facilities in Germany, the R&D centre in the UK and a sales and distribution depot in North America, Rokla is ideally positioned to service its customers across the world. 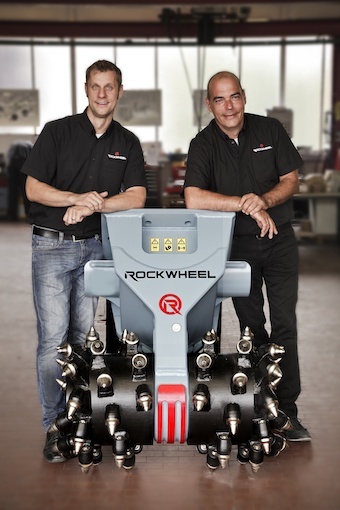 Rockwheel drums now operate in 55 countries, being supplied through a 35 strong dealer network. Considering trade shows to be the best way to meet new customers, the Rokla team travels the world from one exhibition to another. Only this year they have some 60 trade fairs on the agenda. This approach is working out well for the German company: within the space of five years its sales have grown by 82% to €4.2M. On 1 June Rokla GmbH celebrated its 5th anniversary at the Langenburg headquarters with many celebrity guests and local dignitaries attending the event. Among the 130+ guests were Prince Philipp and the Mayor of Langenburg, members of the local and federal congresses and, of course, dealers, customers and friends.